Environment and Development Economics is positioned at the intersection of environmental, resource and development economics. The Editor and Associate Editors, supported by a distinguished panel of advisors from around the world, aim to encourage submissions from researchers in the field in both developed and developing countries. The Journal is divided into two main sections, Theory and Applications, which includes regular academic papers and Policy Options, which includes papers that may be of interest to the wider policy community. Environment and Development Economics also publishes occasional Policy Fora (discussions based on a focal paper). 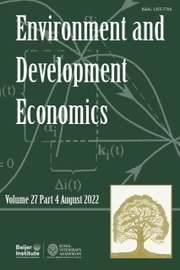 Recent special issues have included 'Poverty and Climate Change', edited by Stephane Hallegatte, Marianne Fay and Edward B. Barbier, and 'Natural Resources and Economic Development' in collaboration with the Partnership for Economic Policy (PEP), edited by John Cockburn, Hélène Maisonnave and Luca Tiberti. Gold price volatility, tax revenue, and employment: can Burkina Faso's adaptation strategy avoid the natural resource curse?